You Need More Customers…We Can Help Drive Them! 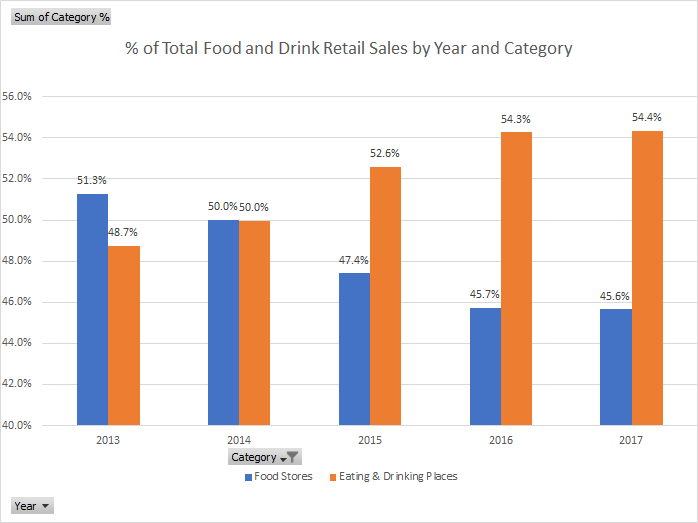 A fresh look at Retail Sales Data from the Tennessee Department of Revenue finds that Total Retail Spending on Food and Drink (both Grocery Stores and Eating/Drinking Places) in Hamilton County increased by 11.7% from 2013 to 2017, the most recent full year available. The good news for Eating and Drinking establishments is that the trend reveals a fundamental shift in consumer behavior , from spending more on Groceries (eating at home) to Dining Out – and in a very BIG way. In 2013, consumers spent $704 Million at Eating and Drinking Places in Hamilton County. By 2017 that number was $877 Million – an increase of 24.5% over the five year period while Food Store sales were down slightly. How Do You Stand Out In An Increasingly Competitive Marketplace? Click to download the FREE REPORT (PDF Format) on Pulse Readers’ dining habits. Having worked as a media professional in Chattanooga since 1985, I specialize in market research and development of marketing programs that drive client business.